I was so happy to have a little fan club last week during our stay at the Pacific Coast Cutting Horse Association's Futurity. My cousin, Shannon, brought her little baby for me to play with and I was so excited to meet Brooke. She is so pretty! She took a nap during the cutting and then we decided to stroll off the grounds to get some lunch. We decided to go somewhere kind of casual and that has pretty quick service just in case Brooke decided it was time to go! I mentioned Odyssey and Shannon had never been so we decided that was the place to go. At the counter as we ordered I saw a Carrot Curry Soup as the special and I jumped all over that. It sounded exotic and it was. I liked that it had the Indian spices that I have been craving lately since my visit to the Himalayan restaurant in Ventura. I also ordered a Salmon Salad complete with feta, red peppers, eggplant and pine nuts. It was the perfect lunch for visiting! I like taking bites of food and then getting involved in conversation. Salads are perfect for that! 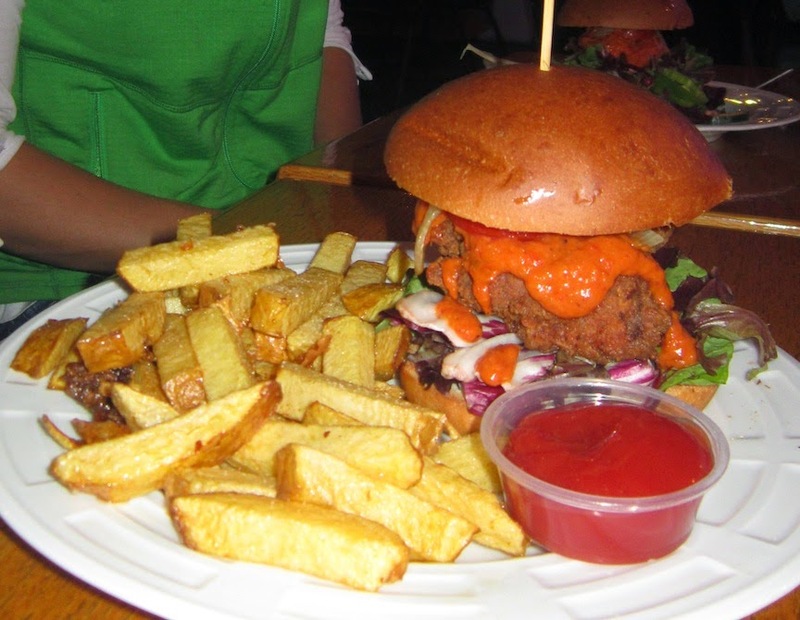 But, to be totally honest, I ate most everything on the plate besides the lettuce! I talked Shannon into the French Dip because I have had it before and knew she would like it. She bounced Brooke on her lap in between bites and commented on the delicious bread made in house. For an easy, quick and affordable meal go to Odyssey and enjoy a meal from around the world! Hello Baseball fans! While Scott, the horses and crew and I are at the Pacific Coast Cutting Horse Futurity in Paso Robles we are also cheering on our favorites, the San Francisco Giants. 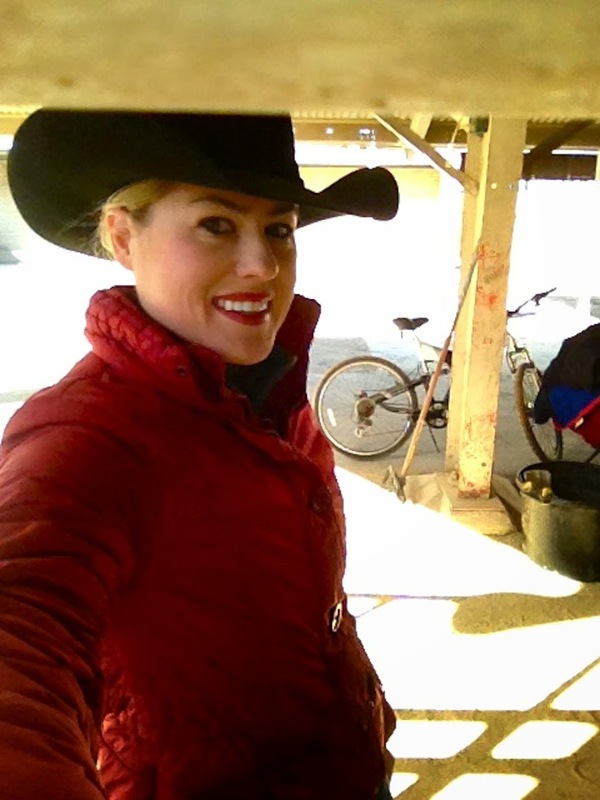 My Mom and I wanted to go out and celebrate a good first round for our futurity horses but Scott wanted to stay in and watch the first round of the World Series. So we called a truce and the ladies went out and he stayed in to watch the game. My mom went the surf and turf route and ordered the Filet, Shrimp and Scallop plate. The 6 oz filet was cooked to her desire of a perfect medium rare, two shrimp totally plump and scallop seared just like perfection. 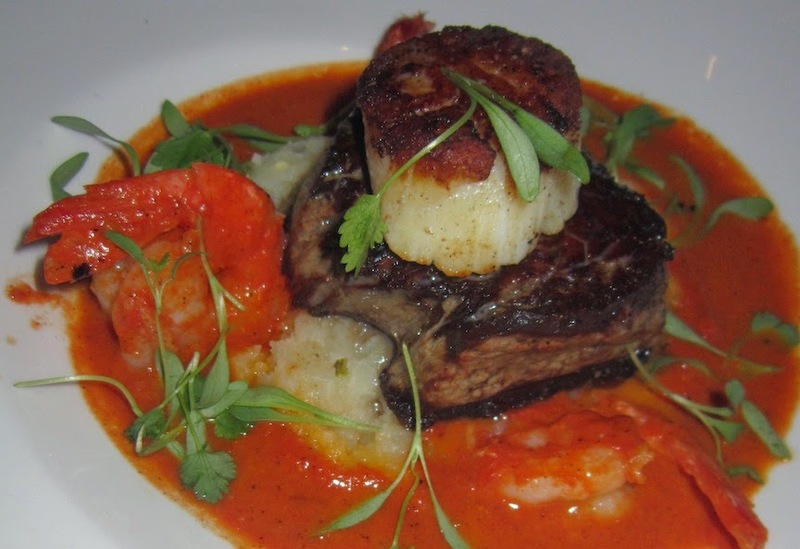 The proteins rested on a bed of jalapeno mashed potatoes and a warm ranchera salsa. She described it as "the best meal she has at a restaurant in a really long time..."
When I saw Scallops on the menu you know I could not pass it up. The Crusted Diver Scallops complete with chorizo brussel sprouts, poblano crema and mashed potatoes made my day. 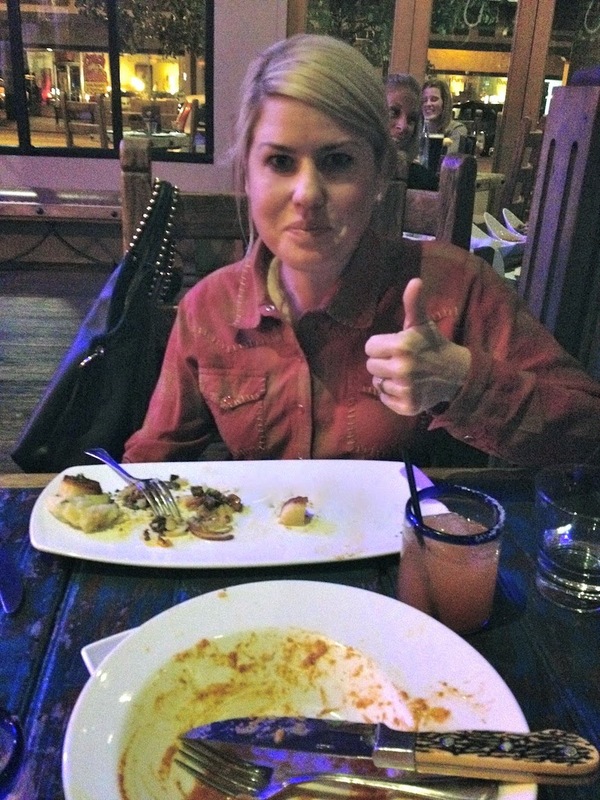 I literally licked the plate until it was totally clean. 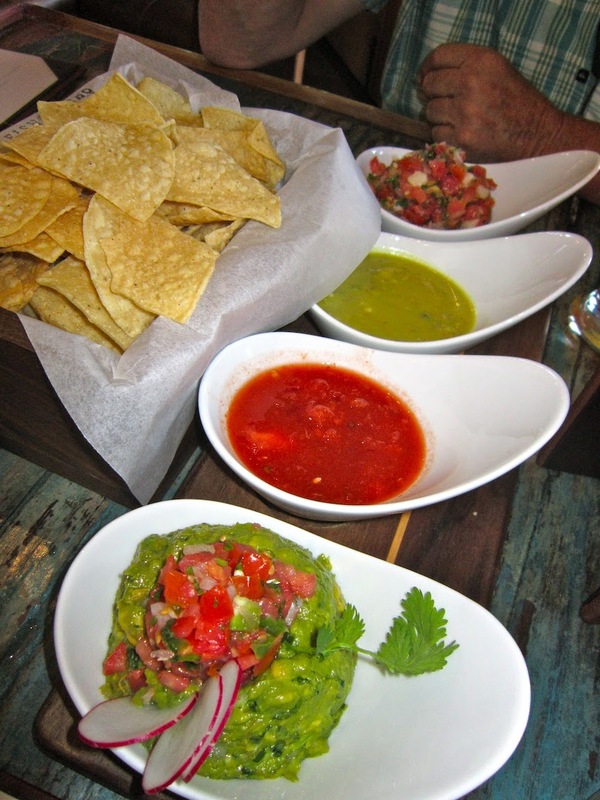 I knew I immediately wanted to try the chips, salsa and Morro Bay guacamole when I came on this visit so we put in our order fairly quickly. The pineapple pico de gallo was Scott's favorite, while i favored the watermelon chipotle. The guacamole was totally fine too. We were greeted with a gift from the chef (being a food blogger has its perks...) to kick off our meal. 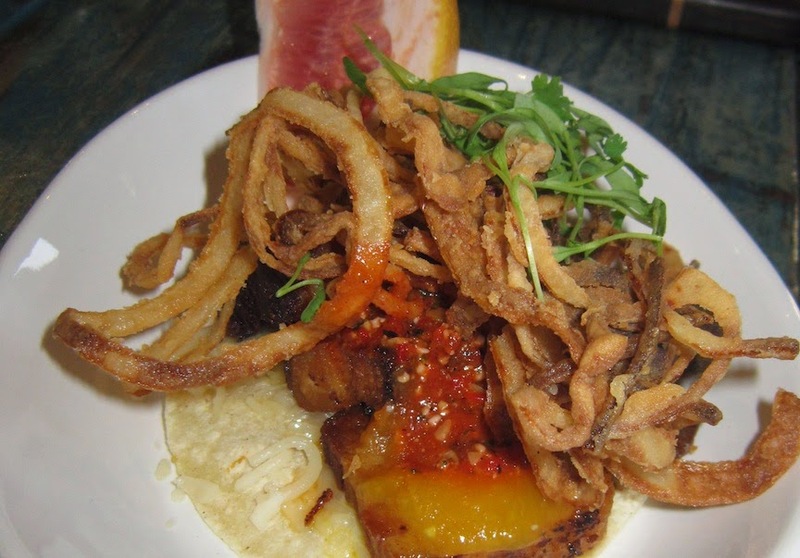 It was a pork belly taco, with crispy onion strings, spicy salsa and served with a slice of blood orange to squeeze over the corn tortilla blanket. I loved it. In fact, I was feeling quite full from all the chips and taco at this point. The taco will be featured on an upcoming menu and I felt pretty cool to get the inside bite. Feeling already pretty full, I decided to solider on with the Oysters Oaxaca. Six Blue Point Oysters topped with what they have described on their menu as chorizo and cotija crumbles. 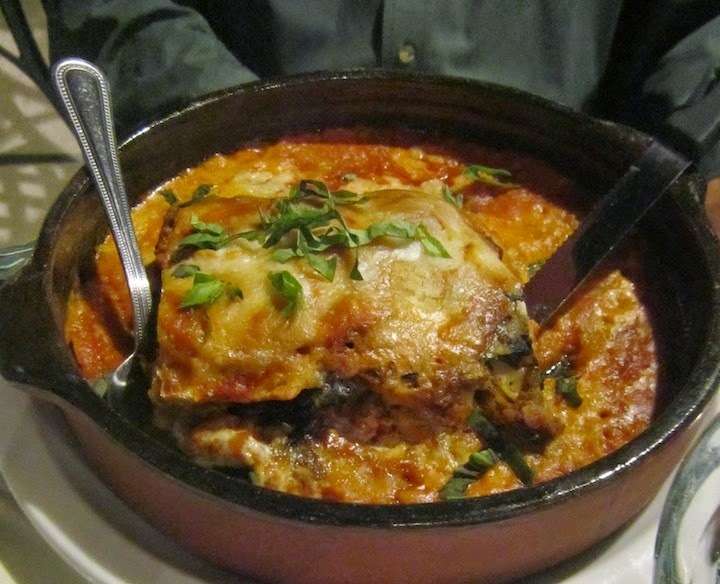 It actually was topped with a thick layer of thick cheese that took over the delicate taste of a baked oyster. I literally took off the layer of cheese before eating so tasting an oyster could be detected. I think these need to be switched up a bit. 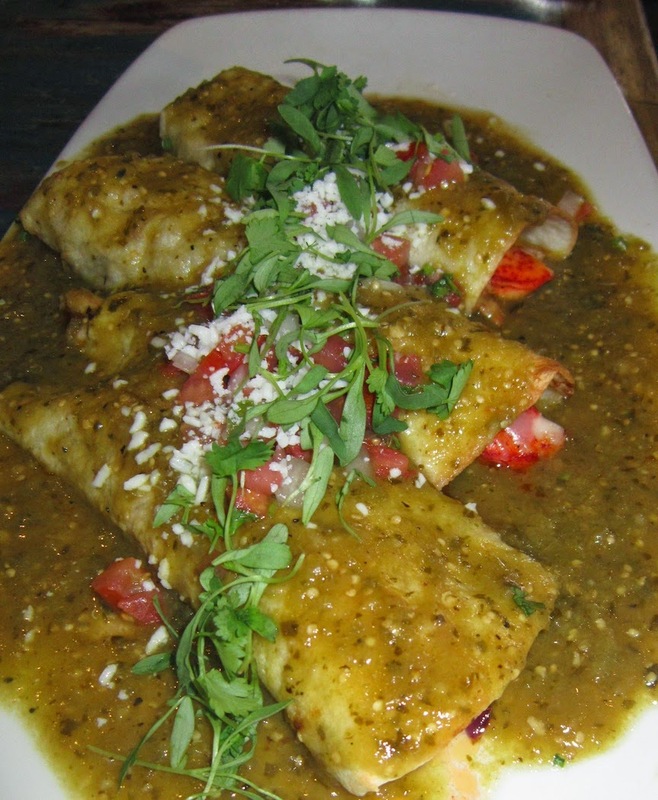 Scott is a Lobster Enchilada fan so when he saw it on the menu I knew he was old on it. Let me start off my saying, the portion size is huge! You get a lot of food. He noted that the lobster meat was only claw meat and would have been excited to get a piece of tail meat. He could only finish two but did enjoy the zesty tomatillo sauce. As I explored the menu on my second visit it obviously was not quite as successful as the first but I do believe the third time will be a charm as we have to go again to let Cowboy Ron have a turn at bat! I have to admit I have had some previous visits at this restaurant that were less than stellar but lately, they have been knocking it out of the park. Just to make sure they were on a roll I dined here three times before giving them a solid thumbs up. 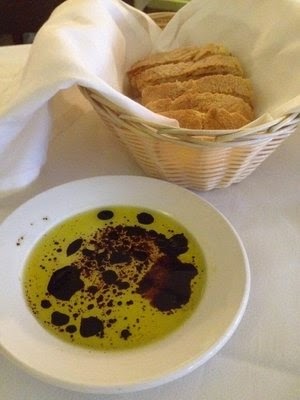 The olive oil and balsamic on the table that greeted me with the bread was terrific. Everything I look for for a go to nosh while deciding what to eat. 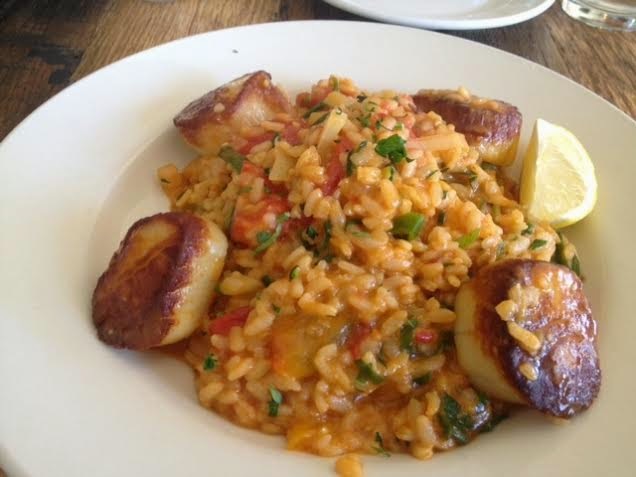 I got a Risotto special that featured Seared Scallops, tomato, onions, diced arugula and finished with cream. It was delicious. My only complaint it wasn't on the menu the next time I dined there. It was totally fantastic and look forward to when it is on the menu again. Dana orders the same thing every time and lucky for her the Panino Canoviano is on the menu constantly. 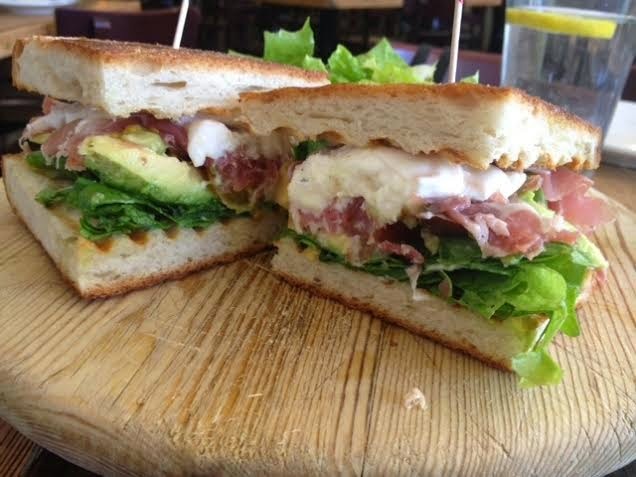 The sandwich features mozzarella cheese, arugula, tomato, avocado and proscuitto. It looked as good as it sounded! I am impressed with its price too, what a deal for $8. 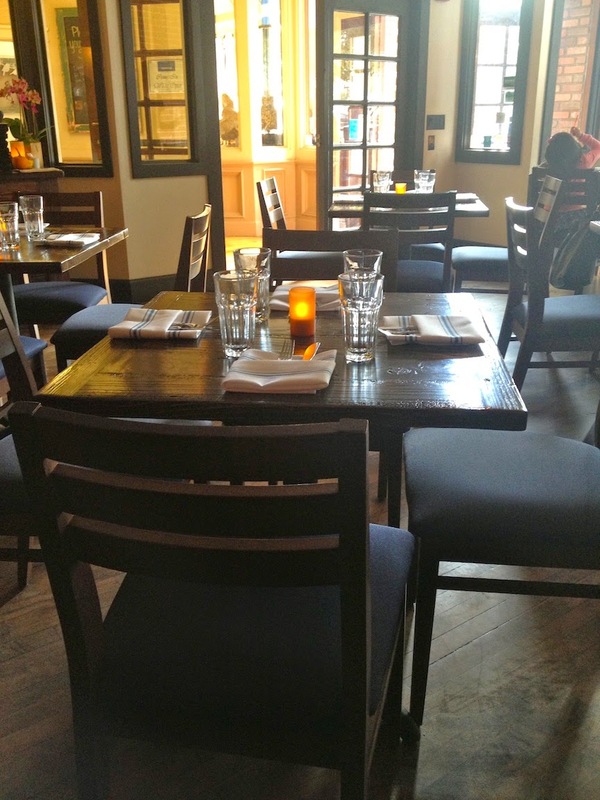 I do have to say that Osteria Monte Grappa is on top of its game and I am happy to give it my good review. Restaurants are hard to leave people feeling satisfied and I have left feeling ecstatic her latelly. Go get a bite for yourself! We are really into sports right now as the Giants are playing in the WORLD SERIES as a wildcard team! Yee haw! 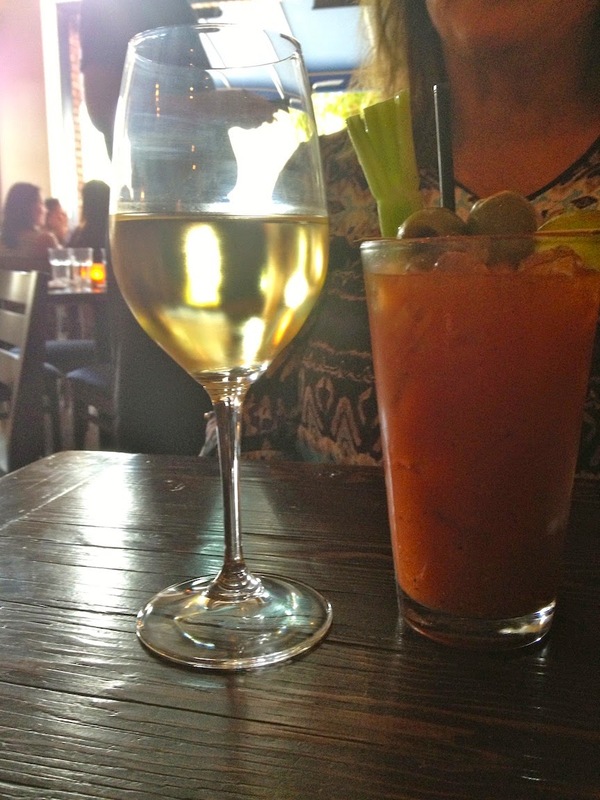 But, this particular evening we decided to try out the new Giorgio's to watch the San Francisco 49er game. We sat at a table in the middle of the dining area to give us room to clap, cheer and invite our friends in town to join us. We started with some Mozzarella Toast with a tomato dipping sauce. This bread was perfect for snacking but if you are afraid of a little garlic breathe you had better stay away from this one. It would freak out the most evil of vampires! Next, I had Mary's Organic Chicken Strips. The chicken was cooked perfectly and the all white meat totally tender! I loved the breading, golden brown and crunchy! 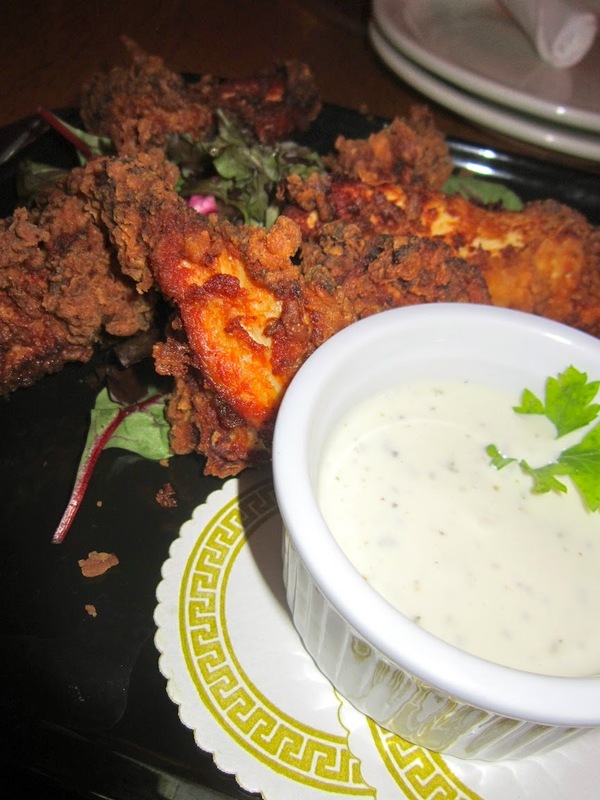 Dipped in ranch dressing, it was just awesome. I even had enough to take home with me and mix it up with salad the next day. Scott ordered the Caprese Sandwich complete with huge slices of Mozzarella, tomato, cucumber and lettuce. A balsamic drizzle loosened things up and made the sandwich complete. If Scott could critique the sandwich he thought the bread to sandwich ratio was high. A thinner bun might be a better option. Last but not least was the Fried Chicken Sandwich Special that Dana and Brandon both enjoyed. The Buffalo sauce made brandon think it was spicy but Dana thought it was just right. I am sure the chicken was the same chicken used for my chicken strips order because they both loved the chicken. The fries were a little under done but it was probably because they were such a thick cut. Thinner cut potatoes would clear that right up. 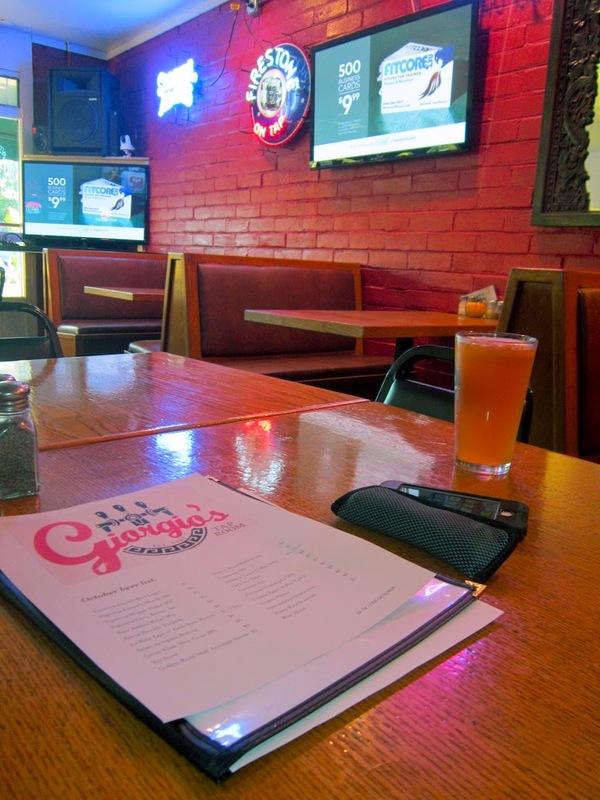 Giorgio's is the East End's best option for football and World Series action. Give them a shot! I have been burned out on my usual picks of food. Things have been blah to me lately because I have been lacking in variety so I decided to mix it up and eat at a place I have never been to... Himalaya Cuisine. 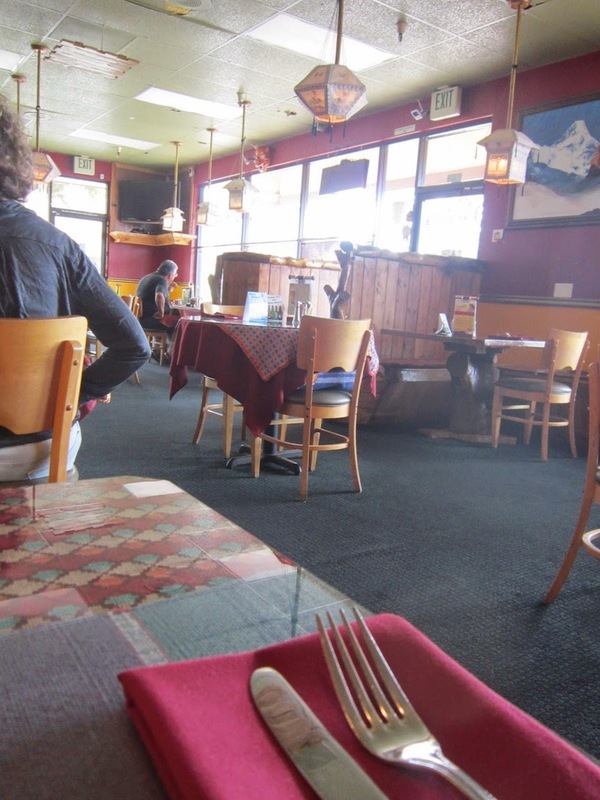 It proudly serves food from India, Nepal and Tibet. 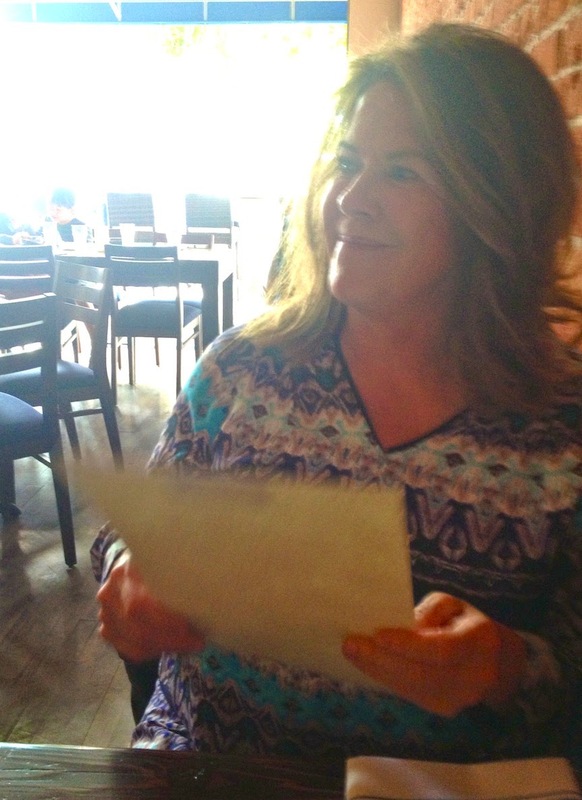 I sat down and was given a menu that did not look too familiar to me so I made my best guess at what I would like and prayed it would be delicious. 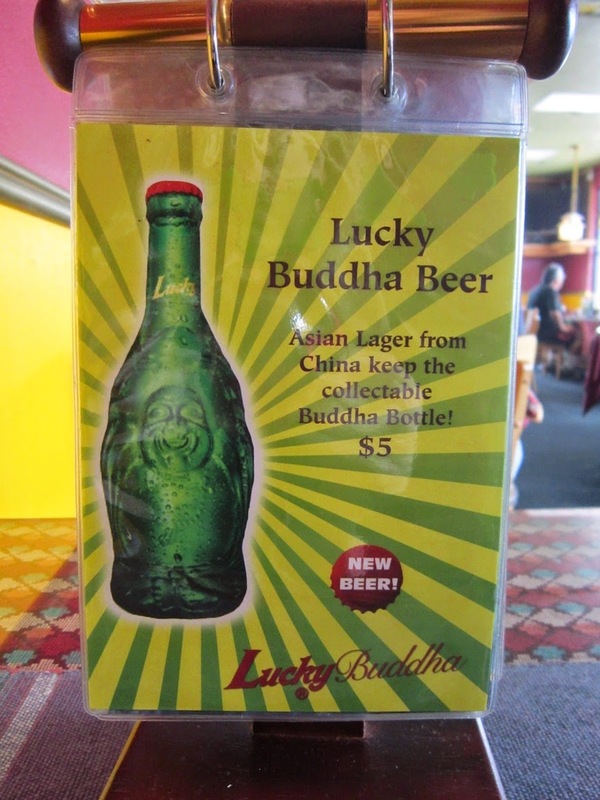 While I waited for my food I noticed this ad for an Asian beer. How cute is the bottle?! 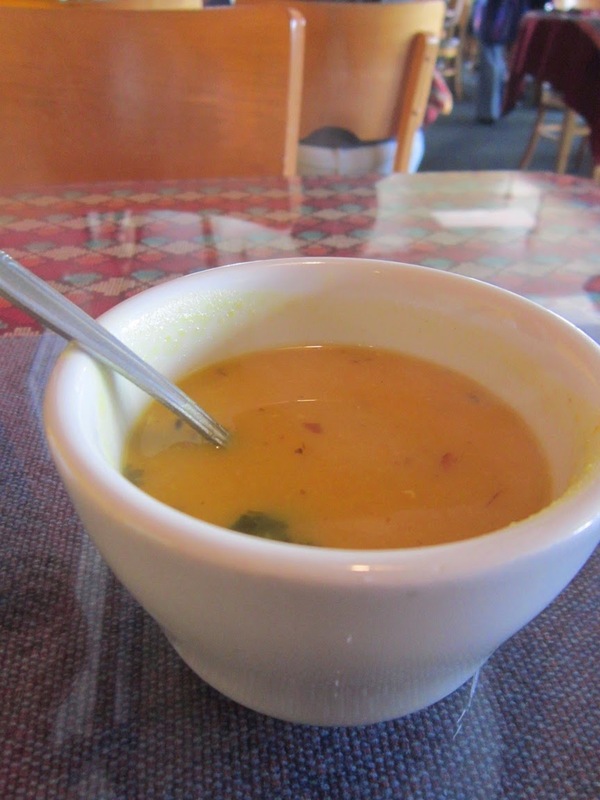 They brought out a lentil soup called "Dal" that came with my Lunch Special order. It was lovely. The spices warmed me from the inside out. The ginger is the soup could be tasted and it gave me a comforting feeling that awakened my senses. After I licked my soup bowl clean my lunch special was presented in front of me. I ordered the Shahi Korma Chicken with rice and chutney. The chicken was so tender it practically melted in my mouth and the sauce of the korma was a tad spicy, I could have handled more but didn't want to be cocky my first trip out of the gate. The creamy base seemed to mild the spice. I will be back, for sure, ready to explore the rest of the menu... I still have a lot of countries to dine at it seems! The menu is separated by the regional cooking... How fun! I am so lucky to have met my dear friend, Dana, not only is she a wonderful person but she is a total foodie just like me! 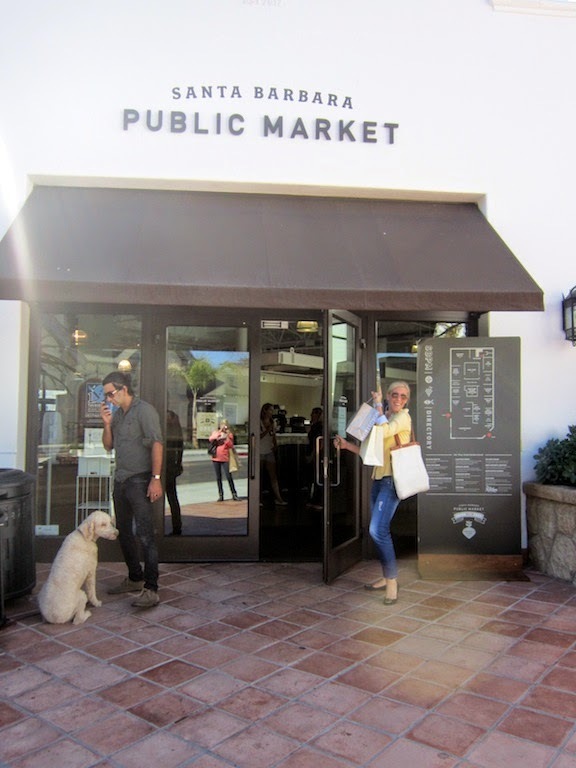 We love a good lunch/food adventure so we loaded up and high tailed it to Santa Barbara to check out the Public Market. We both heard it is lovely so we gave it a try! As you walk inside you are immediately welcomed by a gourmet grocery store. The items are familiar to those you would find at Whole Foods and other smaller boutique groceries. The cheese monger is just a few stall down ready to answer any question you might have when wanting to pair with wines or to make the most ultimate grilled cheese sandwich. You will make your way to the next stall that is complete with all things balsamic vinegar and olive oil. The prices are extremely reasonable for what you are getting. I could have spent all day sampling but my cheeks were getting drawn up from all the tart goodness so i headed out. My favorite was the Ancho Vinegar - I had some kick! Across the stall is the fresh pasta booth. How convenient would it be to pop in and grab a selection of hand made ravioli for dinner!? The meat selection comes up next and it was a beauty to look at all the selection of beef, pork and lamb. Everything looked so perfect! 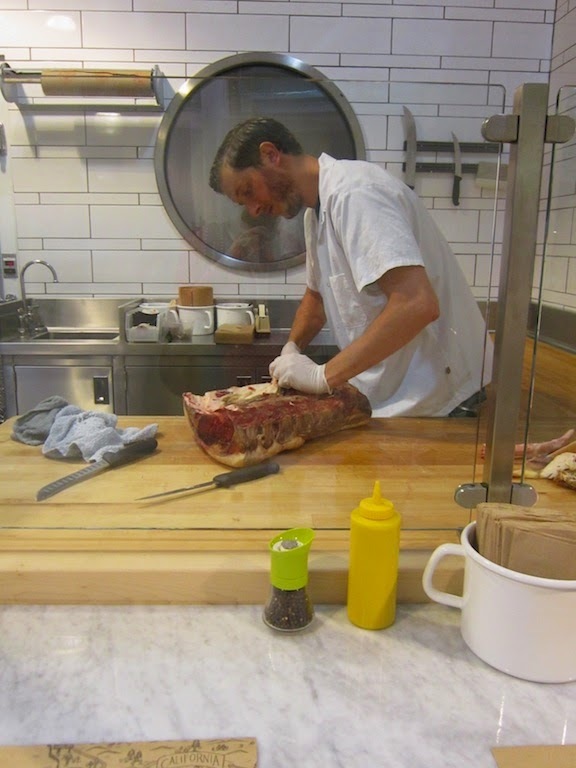 It was neat to see the butcher in action! 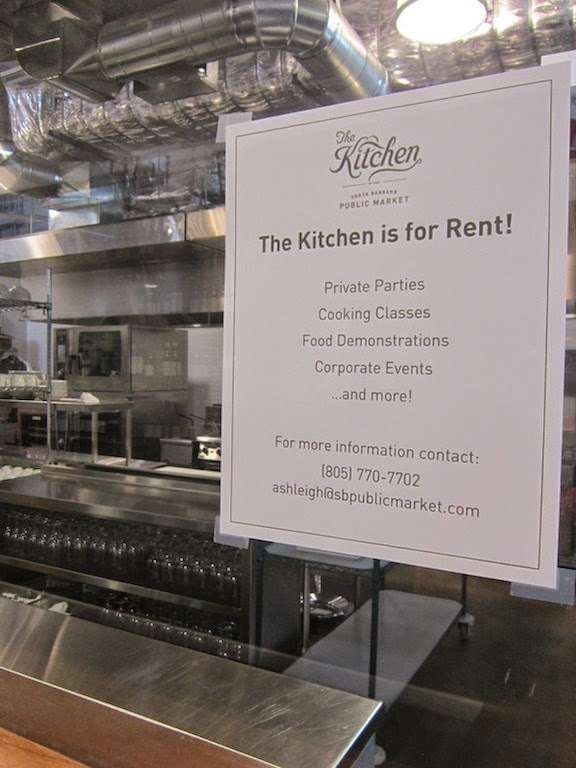 There is even a space that has an industrial kitchen for rent. It would be fun to take a cooking class featured by a local chef. I guess it would even be fun to have your friends over and make a whole bunch of enchiladas too - freezers and and freezers of enchiladas! The possibilities are endless! They have a stall of prepared food like these salad and sandwich combos. I though these tartines were cute! I really wanted to try a cupcake from the dessert stall but the worker ignored me so I took a photo of the precious little gems and moved on. I thought I was always a number one fan of kusshi oysters. I swore they were the best of the best. However, after trying Carlsbad Luna's I now know those are my absolute favorites. 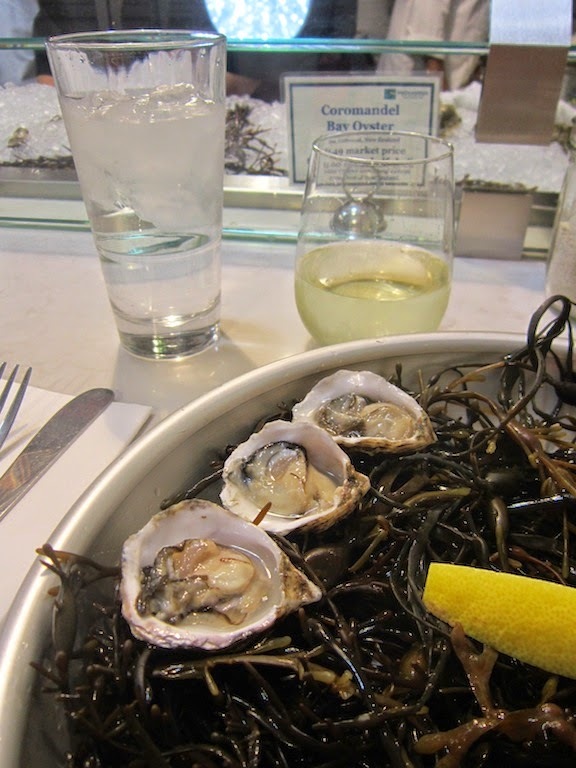 Totally briny, clean and absolutely stunning. These are the bomb.com! It was a fun experience wandering stall to stall at the market. I just wish we had brought maybe a iced cooler to be able to bring some of these treats back to Ojai. The hour long car ride would be an absolute spoil for some of these precious ingredients. I will be back. Cowboy Ron was in town y'all! I love when Ron comes to town to visit because he likes to explore restaurants just as much as I do! We had never been to the re-opening of the Ca'Marco Ristorante located across the Soule Park Golf Course so we decided to give it a try. 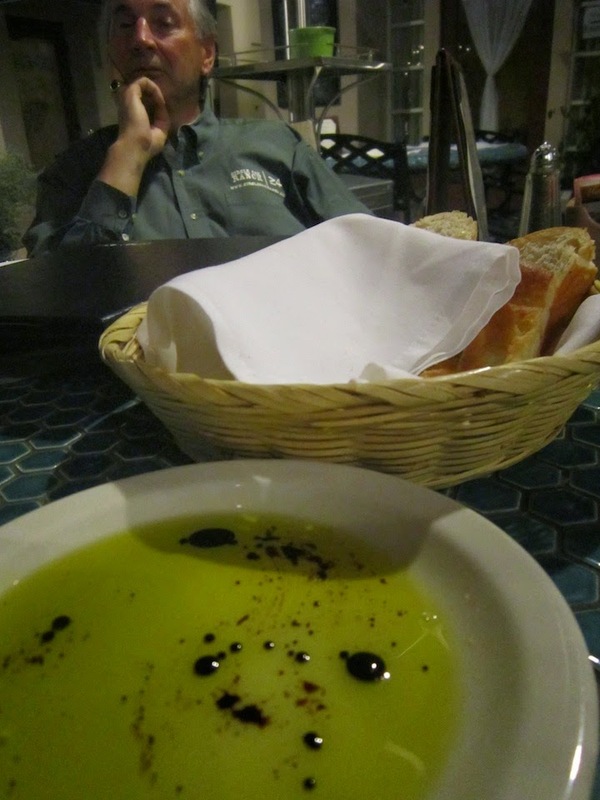 I especially loved the bread that came out with the oil and balsamic, it was kind of toasted and crispy on the ends. Yum! Give me texture! Scott and Ron both ordered Caesar Salads and when this came we all kind of chuckled. It was a loose interpretation of a Caesar Salad but it tasted good and I guess that is all that truly mattered. The dressing was a version of Italian and the tomato was out of place but you know we are not that pickly to throw a stink. It just was cute. 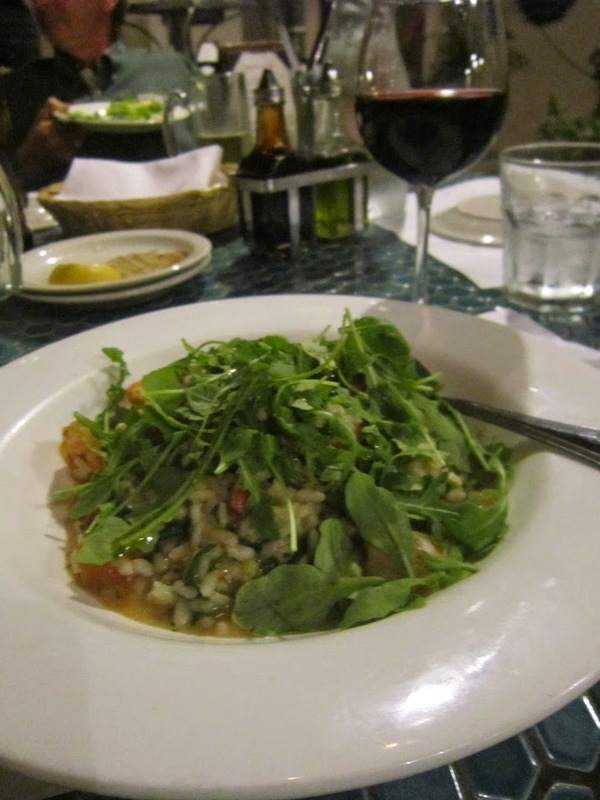 I ordered a very special Risotto and it initially came out looking like a salad but I mixed that arugula right up and it was blended into each bite in no time at all. I picked my meal of the list of featured dishes for the evening and it was listed as to boost shrimp, garlic, tomatoes and arugula.It did featured all those things and then some! The meal was lovely and the house glass of Cabernet Sauvignon that I enjoyed with it was just as perfect. Scott's meal of baked ziti, artichoke hearts, mushroom and Parmesan sounded lovely to him as he ordered it but he was less than thrilled with what was placed in front of him. He ate a fair portion and took the rest home. I have to admit I had it for breakfast the next day and I thought it was tasty. My one critique was that the pasta could have been cooked a bit longer. Just a tad al dente for me. Cowboy Ron ordered the Lasgana and gave it a solid B+. I feel like that should be winning! He thought the cheese:noodle:sauce ratio was off but all in all a darn good meal. I really thought the oven pans that the meals were served in were cute. Bonus points for cute always help! All in all, I was very impressed with the restaurant. It has had its ups and downs in the past but it seems like they are on their game now. It is a tricky location because the lack of parking in the front, but have no fear, just park in the back! I will return for sure.